The good people from Just One Earth are hosting an indie book fair at Alkantrant Library in Pretoria this Saturday – 14 July 2018! If you are in Gauteng, come have a look at what the local authors have on offer. 10% of all proceeds will be donated to Alkantrant Library. If you’ve missed out on your copy of The Flight of the Phoenix or Phoenix Fire, this will be your opportunity to get your hands on them AND have them signed by me and Ryhen E Knight. I have it on good authority that Linzé Brandon will also be there, which means you may also be able to get one of the last few copies of STORM! Because of my awesome cover designer who is full of handy suggestions, I will also have QR codes at the fair that will link you directly my separate short stories on Amazon! So, if you prefer eBooks, come along anyway and get your hands on electronic copies of all my books too! It is time to meet Ida van Os, our illustrator and designer. She has assisted me with a few different projects over the years and, again, she jumped right in when I realised that we need help. Ida van Os – Graphic designer extraordinaire! She came up with a design that was so close to what I had envisioned, I could hardly believe she had done it from scratch in less than three days. We fixed a few small design elements (and several typos *cough cough* – those were my fault) and voilá! 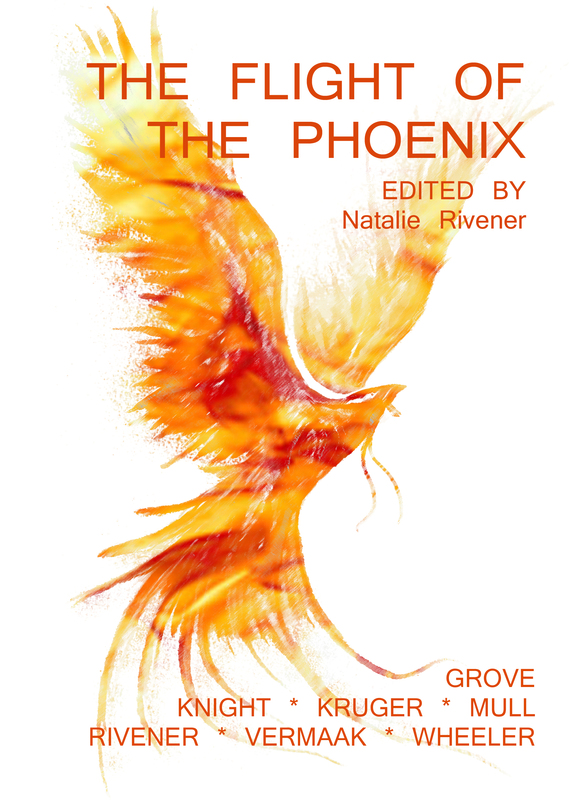 Behold the cover for Phoenix Fire! and User Experience (UX) design. She is a strong arts and design professional with a BA (BK) Information Design, focused in Graphic Design from the University of Pretoria. Ida loves everything that has to do with the fluid process of creating mobile first solutions and apps. She strives to design solutions that answer to the users’ needs in the most intuitive form, packaged in elegant user interfaces. Ida has over 20 years’ design experience with 18 years as an in-house designer and brand guardian in an engineering environment, working closely with business analysts and development teams, to create elegant, effective mobile and web solutions for consumer, government and corporate clients. bowls for friends, she learned how to brew and bottle beer, made a doodle series in pen and ink and is now venturing into needle point, making table cloths. Ida finds her greatest inspiration in traveling and experiencing new and interesting places. It doesn’t have to be an expensive overseas trip, just leave your comfort zone and travel through our country (South Africa, for those who assume some other country) and see how different and amazing life can be. You’ve seen the Phoenix Fire blurbs, now it’s time to meet their authors!